This entry was posted in Uncategorized and tagged boots, cardigan, cold, dorothy perkins, duoboots, skirt, vintage by lillipilli. Bookmark the permalink. 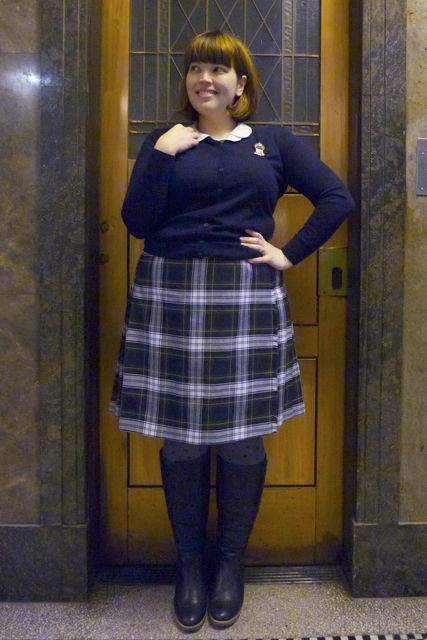 I love the school girl look, but in my middle-ish 30’s I don’t think I ought to try to pull it off. You look great! Nah! 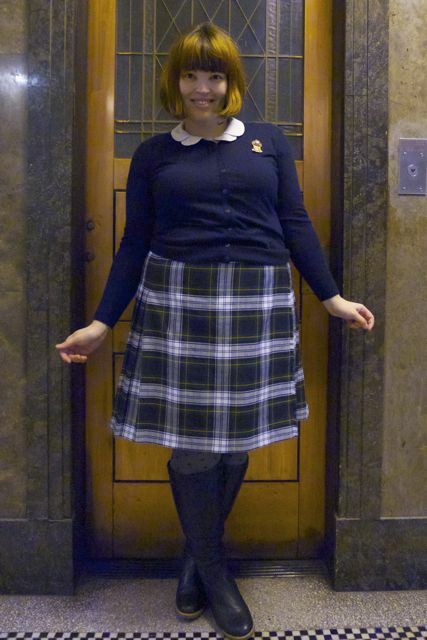 I just turned 34 and I’m still doing the schoolgirl look! 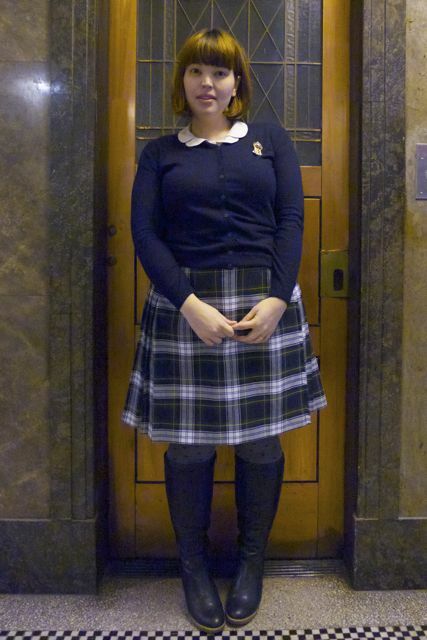 That reminds me an awful lot of the Adelaide High School winter skirt, but flatter across the front. LOL, thats actually the second time I’ve heard that! I’m finding EXACTLY the same thing Jess. I’m wearing a lot of tights and cardigans to winterize my summer frocks! I really love this outfit, it’s the kind of thing that appeals to me. 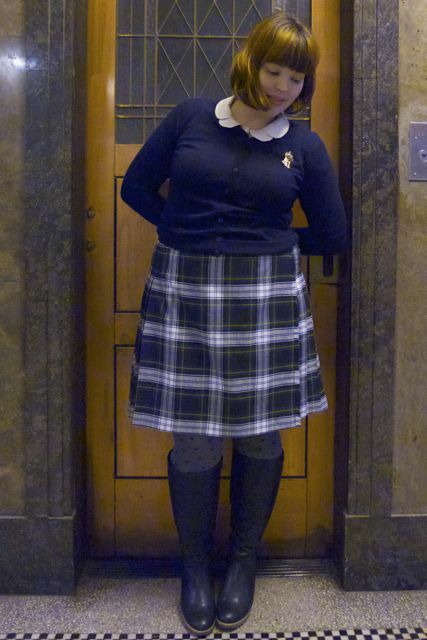 For some reason I am drawn to schoolgirl and librarian-like looks. I think you’ve pulled this off well, it doesn’t look costumey. That brooch is TO-DIE-FOR! Thanks for linking me up! Cute brooch- love it! Love that you wore it to the dentist!!! Love the outfit! Very cute! Which Duo boots are these? They look awesome? Do they still have them? Very cute, Marnie! Thanks for the link! 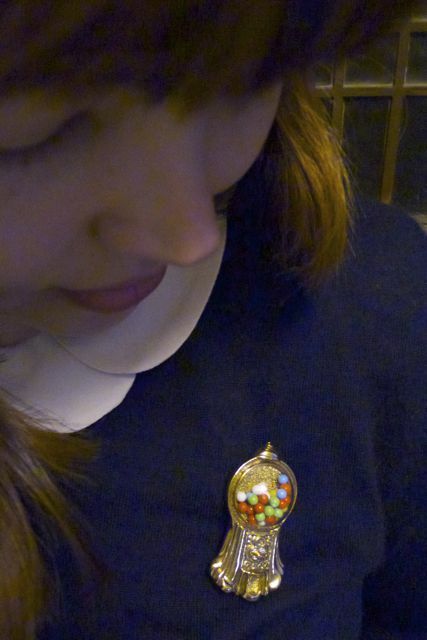 I have a brooch similar to the skipping girl one (but in enamel) and I love wearing it. The come fly brooch is amazing! I might have to buy it, lol! hahah your dentist sounds funny! Ever since I saw this outfit I have been searching for a gumball brooch with moving gumballs, static candy will not do. I must not have been the only one. I think your post has generated a worldwide shortage. The search goes on.